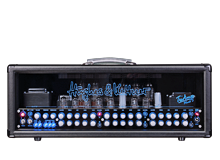 There is no other amp that I've ever played, or owned, that compares to the Hughes & Kettner Triamp Mark 3....it's THAT good!! !...The tone is in a league of it's own and is quite simply the best and most versatile amp there is. Joel began his love affair with guitar in the early 80’s while growing up in Delphi, Indiana. And while he was taken aback by the guitar greats of the day, such as Alex Lifeson, Eddie Van Halen, Neal Schon, Randy Rhoads, etc., it was his love of music and melody that would ultimately guide his future and sustain a career spanning over three decades. Joel was a student at G.I.T. (Guitar Institute of Technology) in the late 80’s studying under such guitar masters as Paul Gilbert, Frank Gambale, Scott Henderson and Don Mock to name a few. He would also later go on to be an instructor at the National Guitar Workshop throughout the 2000’s. Joel has toured extensively throughout the United States and Europe and has had him share the stage with the likes of Steve Vai, Bon Jovi, Savatage, Fates Warning, Tony MacAlpine, Styx and many other world renowned artists as well. He has been featured in countless articles, write ups for his virtuoso skill, discipline, musicality and versatility as a player. Joel has even produced a video instruction series and is very sought out for his advice and wisdom in all things guitar by several world class players. Joel is currently working on a follow up to his his 2011 solo release “Deranged Kids of the Electric Playground” and can be heard on his previous band Stride’s releases Music Machine, Imagine and Ba-Humbug.